In the high-end construction and remodeling world, wide plank flooring is quickly becoming a must-have design element. These wider planks, usually 12 inches wide or more, are required for the right look in larger rooms. However, as striking as wide planks can be, they can also be a bit of a challenge to source, mill, and install. Value engineering will require you to be careful about the species you choose for a wide plank floor. 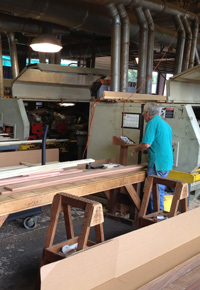 Not only can lumber availability and heightened cost be an issue, but even remote color-matching can become an issue. 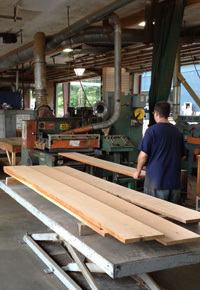 The problem becomes even more significant when you’re sourcing lumber for a large floor, which is typically where wide plank flooring is intended. The more trees from which your flooring is assembled, the greater the variety in both color and grain patterns — which also contributes to color. If your client doesn’t expect a measure of variation and you don’t plan to lessen the differences via finishing techniques, you’ll likely end up with a frustrated customer, even with premium lumber and perfect installation. One species that has been returning to the lime light lately is Walnut. With the allure of rich grain patterns and a chocolate brown hue, this domestic species is understandably in vogue. However, its size prohibits many wide planks. Since Walnut lumber is also prone to defects, perfectly clear Walnut in wide widths is nearly impossible to source. If you’re going for a rustic width with plenty of character markings, width can still be a problem, but the boards will be a bit easier to obtain. Any Walnut floor will have to utilize shorter boards than most wood flooring, though. Because of these issues regarding Walnut, we tend to recommend Wenge for those who want a darker species for their wide plank flooring. Another alternative would be to apply a darker stain to another species. Either way, the additional work needed will translate into an increased price for your customer. Because of the size limitations of almost any species, wide plank flooring typically represents a complete cross section of a tree. Boards are flatsawn in order to achieve the maximum width yield, and the wider boards from near the center of the tree offer two stable edges that include both quarter and rift sawn grain, surrounding the volatile pith area. As the quartersawn areas respond to shifts in moisture levels by expanding and contracting across the board’s thickness, the pith will respond by expanding and contracting across the width, creating a hinge-like affect with the outer areas cupping around the pith. 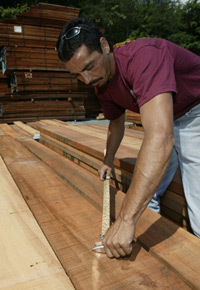 While aiming for the highest amount of quartersawn material possible will increase stability, the only way to eliminate the pith area is to decrease the width of the board. The only other option is careful drying, along with slow, steady milling and re-milling that promotes acclimatization of the boards. For notes about installation of wide plank flooring, take a look at Part 2.